It’s import to know what you are talking about when you decide to update your kitchen cabinets. You need to know what your options are and the approximate costs for comparison. Kitchens tend to be the ‘heart of the home’ and can be a reflection on you. Avoid making any major remodel mistake by knowing the lingo. Knowing this can save you hundreds or even thousands of dollars. The following is an explanation of the industry terminology. Restoration; Cabinet Finish & Repair: Are you content with the color of your existing cabinets but your finish has seen better days? Then cleaning, repair and restoration may be the solution for you. This is a fast (usually a 1 day process) and relatively inexpensive way to revitalize and protect your existing cabinet finish. 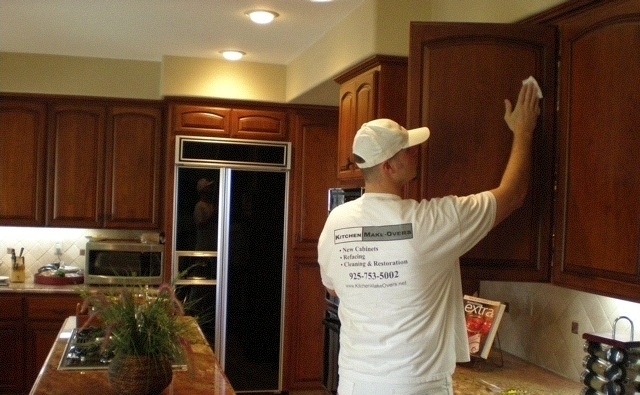 Get a ‘like new’ appearance for thousands less than refacing or replacing your cabinets. You may think about adding pull-out shelves, a tilt tray or decorative hardware for a more updated, user friendly kitchen! Refinishing: Cabinet refinishing is a tricky process. It consists of removing the existing paint or stain finish (by either using chemicals or heavy-duty sanding or both), and re-staining or re-painting using the same materials, i.e. cabinets, doors and drawer fronts. Since the materials have already been through the finish process the result cannot be guaranteed. The wood may react differently to the new finish. Also when the paint is completely removed from the doors, the wood may have imperfections on them that were hidden by the paint finish, thus forcing you to either paint your cabinets or purchase new doors and drawer fronts. Refacing: Are you wanting to change the color or the wood species of your cabinets? You may consider refacing your cabinets. This consists of replacing your doors and drawer fronts with quality, solid wood doors. Then a wood veneer is applied or bonded to your existing cabinets to make them look like brand new cabinets! Crown moulding is installed and really dresses up the cabinets. Refacing is a great option if you plan on keeping your existing floors and countertops. Many reface jobs are completed in 5 days and have a limited warranty for 10 years. Remodel/Replacement: For those customers who are in the market for a brand new kitchen, there are three ways to buy new cabinets: custom cabinets or purchasing a cabinet line (semi-custom) and in-stock cabinets. Custom cabinets are not always priced out of the typical homeowner’s price range like in the past. Construction prices have come down across the board and custom cabinets are now competitive with the semi-custom modular cabinet brands. Designing your kitchen from the ground up can give the homeowner the design control that they desire. One of the most beneficial things about replacing your kitchen cabinets is that you can add much need storage and organization to your kitchen. Just keep in mind with replacing your kitchen cabinets you will also need to install a new countertop, update your electrical outlets to according to code and folks usually replace their sink and faucet since they are going through the hassle of a full remodel. Just remember how important your cabinets are in determining the feel, functionality and look of your kitchen. Adding interesting hardware (knobs, handles, pulls) to the cabinets can really increase the beauty at a relatively low price. Think about adding or changing your backsplash. There are so many creative and interesting backsplashes on the market; glass, copper, metal, tile. Be sure to research all the backsplash materials available before you make your final decision. You don’t want to choose something you’re not entirely happy with.